It’s already mid-November and yesterday we had our first snow of the season! It seems as if October flew over us, so we wanted to highlight some of our favorite events from Archtober! This year marked the 8th annual Archtober celebration, a month-long event that takes place throughout the month of October. Organized by the Center for Architecture, Archtober celebrates New York’s architecture and design through various curated activities, programs, and exhibitions. Domino Park, located in Williamsburg, Brooklyn opened June of this year. 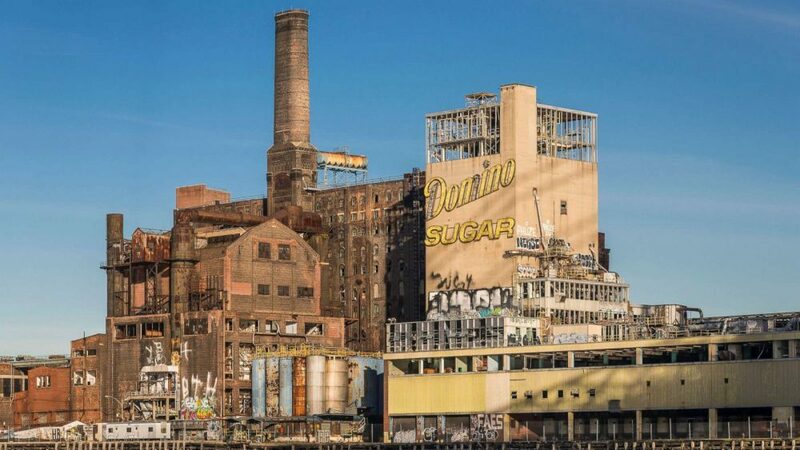 The site was actually the home of Domino Sugar Factory which closed in 2004. For years, the 11-acre land lay dormant while talks over development flung back and forth between community members and city officials. Finally in 2012, the land was acquired by real estate development firm Two Trees Management Company. Redevelopment began and Domino Park opened this summer. The redevelopment of the space poses an interesting juxtaposition between the past and the present, showing the evolution of spatial areas over time. 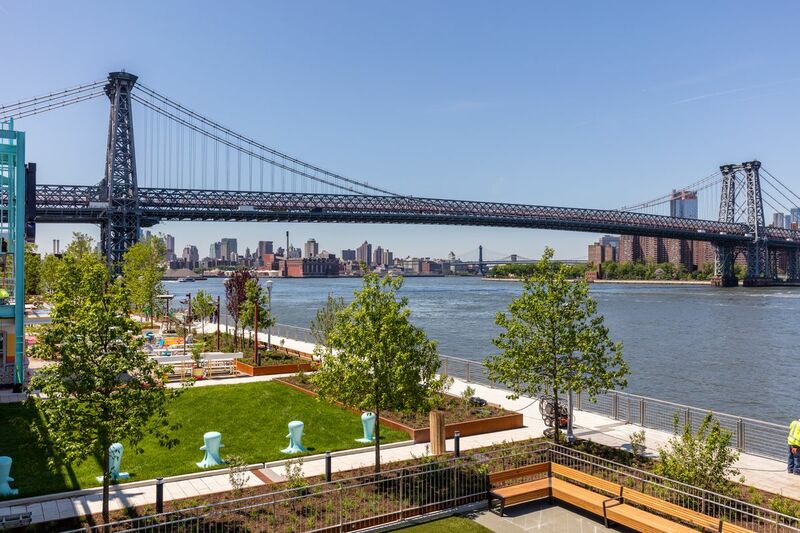 And from this project, we can see the development of an entire community – the development of Brooklyn’s east waterfront community – and the evolution of what once was a largely industrial community to what it is today: a lively community of vibrant synergies. But the legacy of the people that shaped the community, and the community that shaped the history remains. And it is through the architecture of the park we can see the merge of the past with the present. Domino Park 2018. 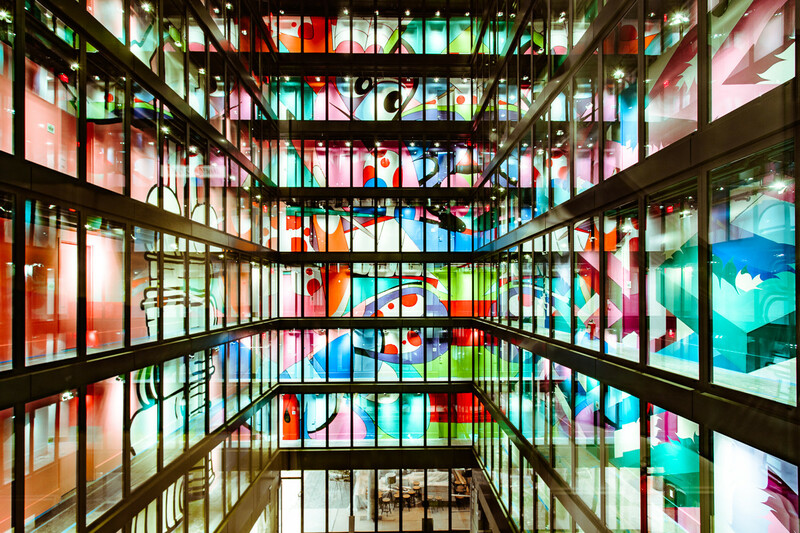 Courtesy of Curbed NY. 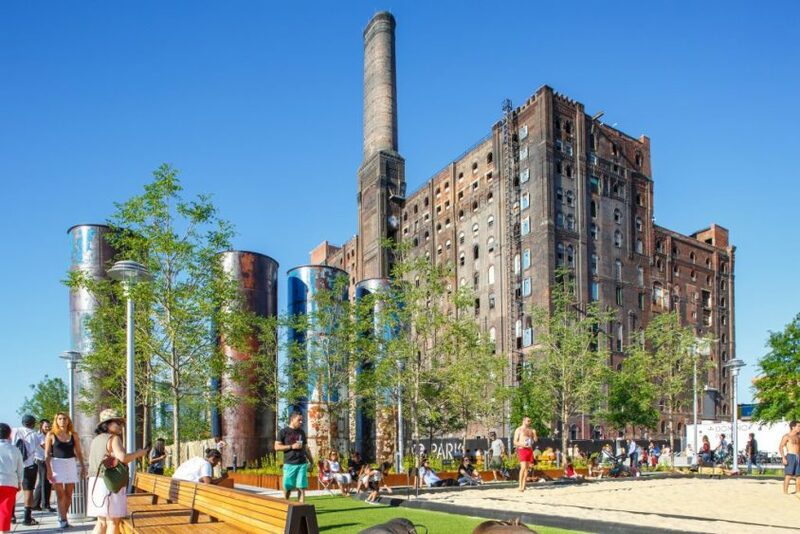 Before becoming Domino Park, the site was the home of Domino Sugar Factory. Courtesy of Paul Raphaelson. Domino Park 2018. Courtesy of solepsizm / Shutterstock.com. Five Manhattan West was another point of interest to us. Though it boasts its modern appearance today, its history actually dates back to 1969. 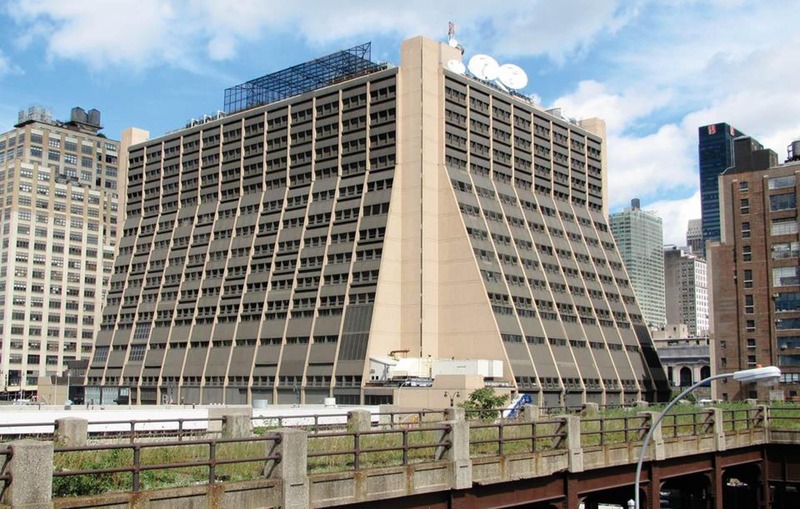 With its first inception in 1969, the building was applauded for being the paradigm of the late Brutalist architecture. But over the years, it had become more of an ancient artifact and many people began to consider it an eyesore because of its hard, formidable structure. Even talks over its demolition took place. 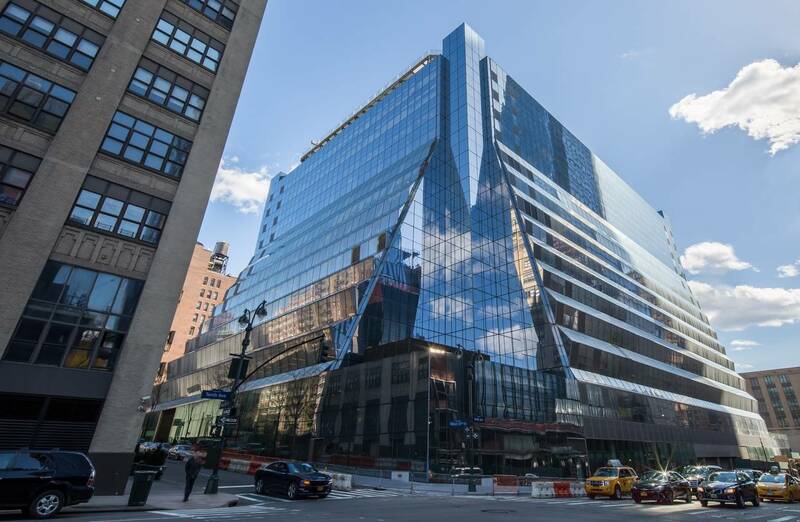 Eventually, the building underwent a massive facelift and today, it showcases a brilliantly modern structure with a glass facade that zig-zags down like a magnificent manmade waterfall. Five Manhattan West 2018. Courtesy of Brookfield Property Partners. Before the renovation. Courtesy of REX. If you didn’t have a chance to check out these buildings from Archtober, make sure to check them out some other time. There are also a multitude of other structures totally worth exploring!